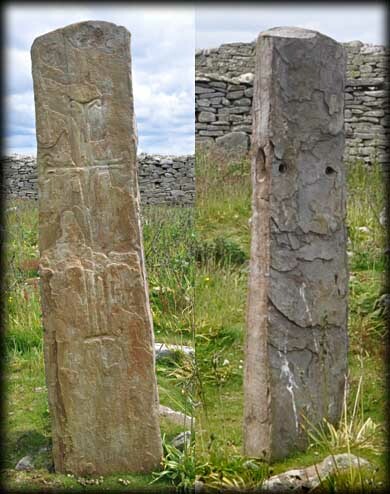 There are two pillar stones situated to the north of Templemolaise, aka the Man's Church. The most northerly of these pillars is known as the Birthing Stone. It stands 1.32 metres high and is 0.34 metres in width. Inscribed on the west face, shown above, is a beautiful cross with serifed terminals and a long shaft. There is an outline incised around the cross. About two thirds of the way up each side of the pillar stone there is a large oblong hole about 0.25 metres in length. These are linked to two small holes, shown far right, in the back of the stone. It is believed that originally these holes may have held wooden arms that were secured with nails through the smaller holes in the back. The pillar acquired the name "The birthing stone" in more recent times when the stone was used during rituals relating to fertility and child birth. There is a similar holed stone next to the enclosure surrounding Templenaman (The Women's Church) which makes it too easy to presume, as I did, that this other stone is the birthing stone. 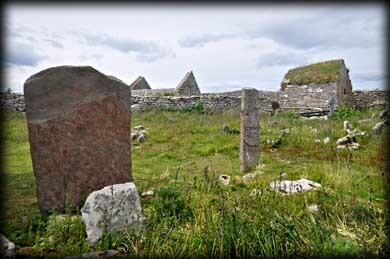 Originally there were about 90 inscribed stones in situ on the island but many of these have been removed to the Old Schoolhouse for protection. Discovery Map 16: G 5737 5387. Last visit June 2012.